Charger. - This is electronic circuit schematic of Lead Acid Battery Charger using LM317 like in Figure 1 below. In this circuit schematic the basic component used are LM317 IC and transistor. In here we will give you global description about circuit schematic of Lead Acid Battery Charger using LM317 and then we will give you link to continue your reading from original source as external website. 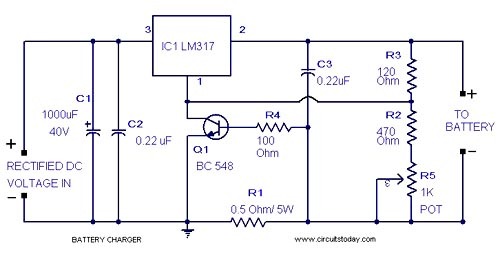 Circuit schematic like in Figure 1 above is Circuit Schematic Lead Acid Battery Charger using LM317 IC. Circuitstoday site describe that here is a lead acid battery charger circuit using IC LM 317.The IC here provides the correct charging voltage for the battery.A battery must be charged with 1/10 its Ah value.This charging circuit is designed based on this fact.The charging current for the battery is controlled by Q1 ,R1,R4 and R5. Potentiometer R5 can be used to set the charging current.As the battery gets charged the the current through R1 increases .This changes the conduction of Q1.Since collector of Q1 is connected to adjust pin of IC LM 317 the voltage at the output of of LM 317 increases.When battery is fully charged charger circuit reduces the charging current and this mode is called trickle charging mode. And now you can read more you knowledge about Circuit Schematic Lead Acid Battery Charger using LM317 from the original source article using link [here].